Eugene Tay is the Executive Director of Zero Waste SG, a non-governmental organisation dedicated to helping Singapore eliminate the concept of waste, and accelerate the shift towards zero waste and the circular economy. This September, they launched a new campaign that took Singapore by storm – The BYO Singapore Campaign. The campaign offers incentives customers who practice the concept of “bringing your own” and aims to encourage more Singaporeans to practice this habit through incentives. As of now, there are about 21 vendors who are participating in this initiative, with 234 outlets spread across Singapore. 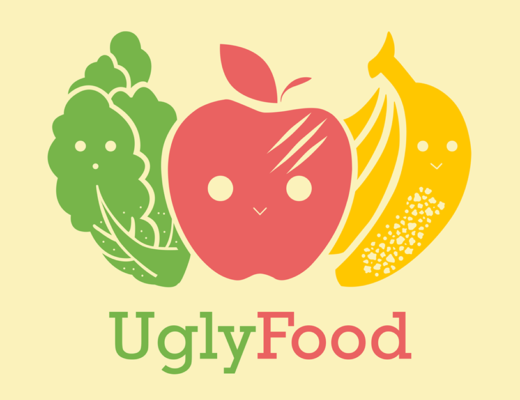 We talked to Eugene to find out more about this campaign, the challenges faced and its future. TSP: What inspired you to start the BYO Singapore campaign? Eugene Tay: Single-use plastic disposables pose a serious environmental problem around the world. In Singapore, the most common type of waste disposed of is plastic waste and the recycling rate for plastics has remained low over the past 13 years. So we can’t depend on plastic recycling and have to go upstream and reduce plastic disposables at source. One way is to encourage consumers to bring their own reusables with incentives provided by retailers. TSP: Can you tell us a few challenges you faced when launching the BYO Singapore campaign? Eugene Tay: Majority of the retailers did not respond to or rejected our recruitment for the BYO campaign via emails or direct visits to stores. Some of them cite additional operating costs if they provided incentives, or that there are some challenges in the operations when they have to use the reusables provided by customers. TSP: Since the launch of the campaign, what response have you received from the public? Are they generally supportive of this campaign? Eugene Tay: The response from the public has been positive and they like the idea of getting incentives when they BYO. However, we have to see if this actually translates into more consumers BYOing during the campaign. TSP: For those who are interested in getting involved with the BYO Singapore campaign, can you share 2 to 3 quick and easy steps to get started? Eugene Tay: Visit the BYO Singapore campaign website at http://www.byosingapore.com and find out the retailers providing incentives and their locations. Visit the retail outlets with your reusables and start to BYO. It’s that simple! TSP: What is the main goal for BYO Singapore campaign and what actions will be taken to achieve that goal? Eugene Tay: The BYO Singapore campaign would provide information, incentives and resources to encourage people to bring their own reusables and reduce plastic disposables. Under the campaign, retailers would offer incentives to customers who bring their own reusable bags, bottles or containers. The main campaign goal is to sign up 500 retail outlets and reduce 1,000,000 pieces of disposables in 2017. The BYO Singapore campaign would reach out to residents in the community, and also to working professionals through roadshows in the central business district and other business hubs. In addition, Zero Waste SG would be providing educational talks to companies and providing office starter kits (electronic copy) that include resources such as posters on BYO, advice on cleaning facilities in the pantry, and how to organise a BYO Day in the office. TSP: What do you think the Singapore government can do to combat the issue of plastic waste? Eugene Tay: Our recommendations to the government on reducing plastic disposables can be found here and here. TSP: Can you share with us 2 to 3 examples on how you lead a plastic-free life? Eugene Tay: I bring my own bottle and bag regularly for my takeaway drinks and groceries. If I know that I’m buying takeaway food or going for an event buffet that serves plastic disposables, I would try to bring my usable container and utensils. 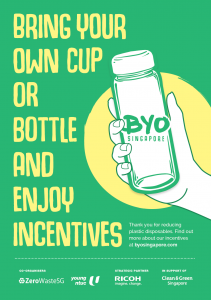 The BYO Singapore Campaign is a huge leap towards the encouragement of Singaporeans to reduce their plastic consumption. 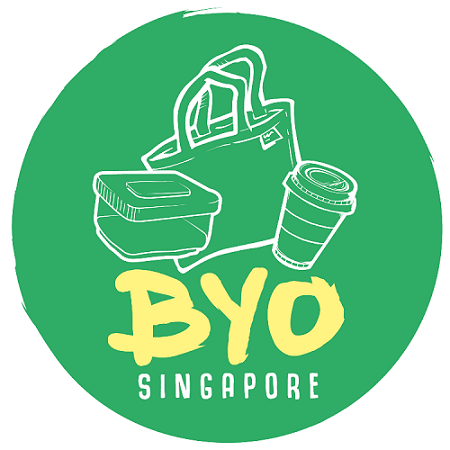 With the issue of plastic waste gaining more attention worldwide due to its impact and gravity, it is encouraging to witness the efforts taken to combat this issue and hopefully, more Singaporeans will start taking action and reduce their plastic waste by BYOing!